Ahhh... sometimes there's nothing better than dragging a chair out to the back yard, sitting back, and watching a pile of sticks. Good times. Found by Dawn, who thinks the sticks must be a selling feature. "We have a wonderful view of the woods out back! And look, we even included a chair, so you can sit out back and enjoy the view!" Though the purpose of the pile of sticks continues to elude my understanding. What on earth is it for? God, I love this blog. That made me snort. Thanks. "there but for the grace..."
Oh yes, one of those aspirational lifestyle things where we are supposed to buy the house 'cos we want the life they are indicating....so do I want a life where looking at sticks warrants special furniture? Hmmm I'll get back to you on that one. Or maybe it's habitat, for hedgehogs. I like the think the chair is working very hard on getting the sticks to burst into flames, using only the power of its mind. Looks like a fantastic place to relax and write one's Manifesto. How far is the post office? It's the 'secret life of furniture' posts that I love best on your blog. I have to say, this is the BEST blog EVER! It guarantees better laughs than reading newspaper comic strips. Thank you! They've obviously planned ahead. Later, when you've got a nice bonfire going, you can sit on the chair and roast your marshmallow. What's the problem? Even us loners, who have no other chairs or friends, like to roast marshmallows. Who knew that chairs had such deep seated thoughts and beliefs. Loved this one, thank you. "Well, son, this is what happens if you are not good wood: nobody cares for you lovingly with sweet oil or scented spray, you might get a few months of wild fun, but this is where you end up, wrinkled, gray and unwanted." 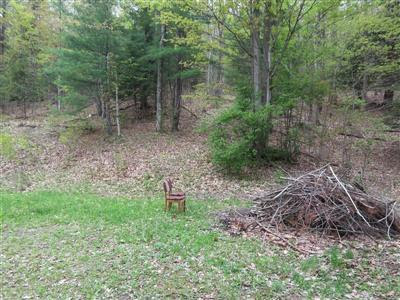 "Ahhh... sometimes there's nothing better then dragging a chair"
Og god, it's the Blair Witch Chair. OH MY GOSH...This is about the 5th or 6th one I've looked at and they all are making me laugh! What is wrong with these people. But this chair one may be my favorite...of course I'm not done yet! Perhaps, it's a future bon-fire? Perhaps it's a wayward chair? "I brought you into this world, and if you keep running around embarassing me with those flashy plastic friends of yours, By God, I will take you apart into KINDLING! So you just SIT there until I say you can move and think about what kind of future you want!" I laughed until I could feel the blood pounding through my ears. Thank you so much for the entertainment your blog brings. What else could be a better treat for a chronic insomniac at 3.30am in the morning.